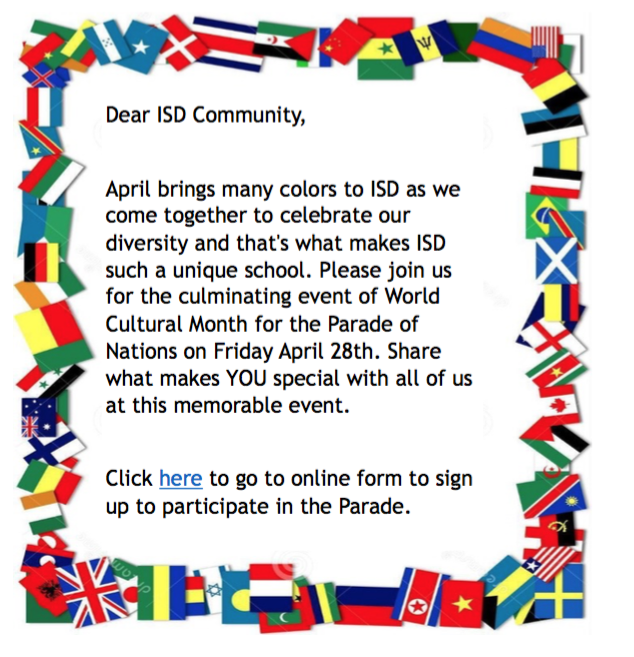 The International School of Dakar will soon celebrate its 8th annual World Culture Month, from April 5-28. We invite you to join us in this memorable month of sharing our cultures! As in the past years, our traditional theme is “diversity”. We want our students to understand, to value and to respect the difference and similarities of our many cultures here at ISD. Senegal arts week / Elementary / tie-dye, Graffiti, sand painting, pottery. Answers to the World Cultural Day Aussie Quiz! Thank you to everyone who dropped in to say "G'day" at the Australian and New Zealander booth at World Culture Day. Congratulations also to Ms Goldsborough who obtained the highest score on the "Down Under Quiz" with 9 out of 11 questions answered correctly! The capital of Australia is, in fact, Canberra, not Sydney! If someone says they are "fair dinkum", it means they are telling the truth. A Moreton Bay Bug, despite its off-putting name, is a delicious species of lobster, the meat of which is found in the tail. Australia's population is about 24 million people. Australians like meat pies and they eat over 270 million of them each year! If someone is "doing their block", it's probably best to avoid them. They are not having a haircut or building on a piece of land – they are really angry and letting you know it! If someone is living out in Woop Woop, they are living in "the middle of nowhere". Aussies will cook a "snag" (sausage) on their barbeques. It is not a good idea to give a snag to your fiancée as an engagement ring! If you are told to "Belt up", don't attach your seat belt or dress more smartly. Just be quiet quickly! Damper is not a heavy coat or a gardening tool. It's an unleavened bread, popular when camping. And, finally, Vegemite is not a fungal condition that affects kangaroos, although non-Australians will insist that that is exactly what it tastes like! It's a very popular black food spread made from yeast and vegetable extract. Study up! We'll give you the drum (tip-off) - there'll be another quiz next year! Parade of Nations registration page.